When you purchase butter at the store there are two choices, salted or unsalted butter. 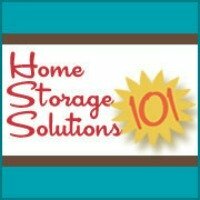 Here's easy tips to know when to use each of these two kinds so you know which to buy, or how to use the one you've got on hand. Holiday baking time is upon us, and with all that kitchen activity comes the consumption of lots of butter. Yum, butter. You do use actual real butter, don't you, rather than margarine? If not, I would suggest you give the real stuff a try. It tastes so much better than the fake stuff. But inevitably you'll run across a recipe while baking that calls for "unsalted butter." 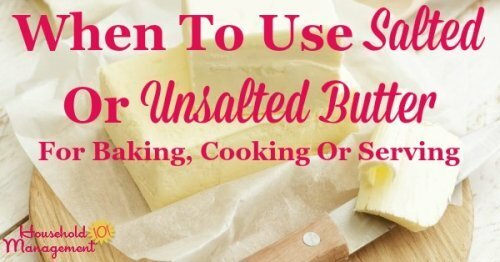 Here's a quick run down of what they're asking you to use, why, and when you should use the salted or unsalted varieties of this kitchen staple, not just for baking but in day to day cooking and life. What's The Difference Between Salted & Unsalted Butter? The difference between these two types of butter is, you guessed it, salt. The unsalted butter does not have salt added, while the salted variety does. So why do they provide both choices? Salt is a preservative and so technically salted butter lasts longer than the unsalted variety. Historically that made a difference, and although we now have modern refrigeration even during travel to the store, they still make both varieties because people got used to cooking with one or the other depending on what they were using it for. While the difference between the two types of butter is salt, the exact amount of salt varies. In fact, the amount of salt in salted butter can vary between brands, but also between batches from the same brand, making it difficult to quantify how much salt you're adding to a recipe, along with the butter, when you add salted butter. Baking, as you know, is a much more precise form of cooking than some others. You can't really just throw in ingredients and it all work out, you've got to measure, and so as you do your baking this holiday season that is why you'll run across recipes that specify unsalted butter -- because they want to be precise. That is also why you'll see recipes that specify unsalted butter, and then add as a separate ingredient salt. It isn't that salt is bad, or that the recipe doesn't make sense. It is that they want a specific amount of salt, and not more or less than that amount. 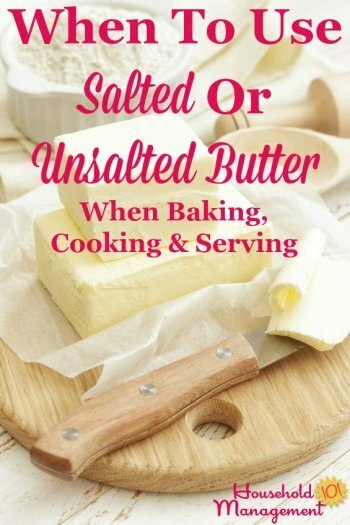 So what should you do when you come across a baking recipe that calls for unsalted butter, but you only have salted in your refrigerator? Don't despair. It won't be precise, but add the salted butter and then cut the amount of salt called for in the recipe by half. It will cut the salt enough that you probably won't notice much, if any, taste difference in the recipe. When you're doing other types of cooking with butter, beside baking, such as sauteeing vegetables for example, the type of butter you choose is really up to you. Keep in mind that if you add salted butter to your pan you should go a little lighter on your salt seasoning since you added some salt already along with the butter. Salt in general can heighten flavors in food, which is why many people do prefer to cook with salted butter. All things being equal, the food will taste better cooked in salted butter rather than unsalted butter, if you don't add any additional salt. If you've ever spread unsalted butter on a piece of bread you might have been a bit disappointed with the taste. Instead of tasting that "buttery" taste you expected and craved, it probably tasted a bit creamy and sweet, but not exactly right. That's because there was no salt in the butter to enhance its taste in the way you expected. If you're putting butter on the dinner table for people to use for spreading on bread, for example, you want to use salted butter. The salt actually enhances the flavor. If you've only got unsalted butter on hand you can add a sprinkle of salt onto your bread and it will do the job of the salt you're missing in the butter itself. What kind of butter do you normally purchase and use? Salted or unsalted? Or do you buy both to keep on hand? Tell me below in the comments. In addition, if you cook or bake with butter regularly, or eat it with meals, you're going to eventually get some butter stains or splatters on clothing and other items around your home. 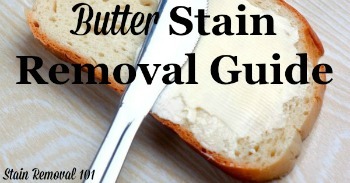 Here is my butter stain removal guide, on the sister site, Stain Removal 101, to help you remove these messes.